Fatty acid methyl ester sulfonate [MES] Appearance: Light yellow to white powdery solid. 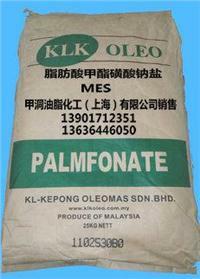 Fatty acid methyl ester sulfonate [MES] total active matter content ≥ 85%. Fatty acid methyl ester sulfonate [MES] pH (1% solution 25 ℃) slightly alkaline. Fatty acid methyl ester sulfonate [MES] Color, Klett (5% aqueous solution) 70. [MES] fatty acid methyl ester sulfonate anionic surfactant MES performance: [MES] fatty acid methyl ester sulfonate surfactants and efficient lime soap dispersants, have excellent decontamination, hard water resistance, low irritation and toxicity, surface activity than alkyl sulfonate (LAS). Safe non-toxic, totally biodegradable and excellent performance with outstanding environmental benefits, and have good wetting, detergency, foam, emulsification, solubilization properties, in particular the strong anti-hard water, lime soap dispersion, in hard water and phosphate-free conditions, still has excellent detergency, foam and wetting. 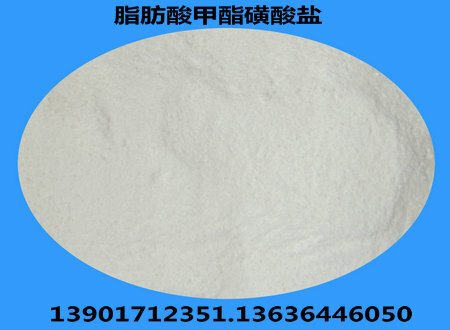 Fatty acid methyl ester sulfonate [MES] is mainly used for bulk soap, soap powder and other calcium-soap dispersants, in powder, liquid and hard surface cleaners has good prospects, fatty acid methyl ester sulfonate [MES ] especially for the manufacture of detergent enzyme concentration. [MES] fatty acid methyl ester sulfonate can be used as emulsifier, ore flotation agents, leather processing aids, rubber and elastomer mold release agents, chemical fiber spinning of the finishing agent, paint and oil dispersant, textile auxiliaries, pesticides, wetting agents, dispersing agents. [Fatty acid methyl ester sulfonate anionic surfactant MES MES] Packaging and storage: Net weight: 25 kg paper bags. Fatty acid methyl ester sulfonate [MES] should be stored in a cool ventilated place to prevent exposure, high temperature and humidity, away from fire and heat.